National news and household events continually waylay my attention. Dejected gutters, palace intrigues throwing glances on complicated and duplicitous political alliances, and a middle-schooler with the sniffles—how can one weigh these things against this small but welcomed audience here for music combined with (mostly) poetry? And so, I found myself short of material as I got ready to record with the LYL Band this week, a problem that the domestic, the national, and the poetic world combined to answer. My wife had sent me a poem from the Confucian Odes recently, a loving gesture gratefully received, and as beautiful as it was, I wondered about the poem and its English translation because of my work here. As the news sticks its tongue out at me with screen-edge notifications (mutterings about the Emperor and his possible private derangement issuing from the far-off capitol) I read again some of those Confucian Odes, an ancient anthology designed to instruct not just scholars or poets, but politicians and bureaucrats. What an odd idea. I suppose distributive requirements in American colleges still require some exposure to literature for those who will eventually serve in those roles, but this anthology was considered core material in Imperial China. And the Confucian Odes are not grand works of moral or civic uplift, rather they are compressed, tiny reports of humble activities, decisions, and situations. They sometimes imply or depict correct behavior, but they don’t explicitly end with a moral. Their lesson may be, in the largest part, that the reader must study them and find the lesson in the everyday. How different would our emperor or his retainers be if this was their schooling? One collection I read mixed in later classical Chinese poems with some of the Odes. It was here that once more I was pulled in by Du Fu, one of those aspiring bureaucrats who was steeped in those odes, but who lived centuries later at a time his country was in rebellion and upheaval. 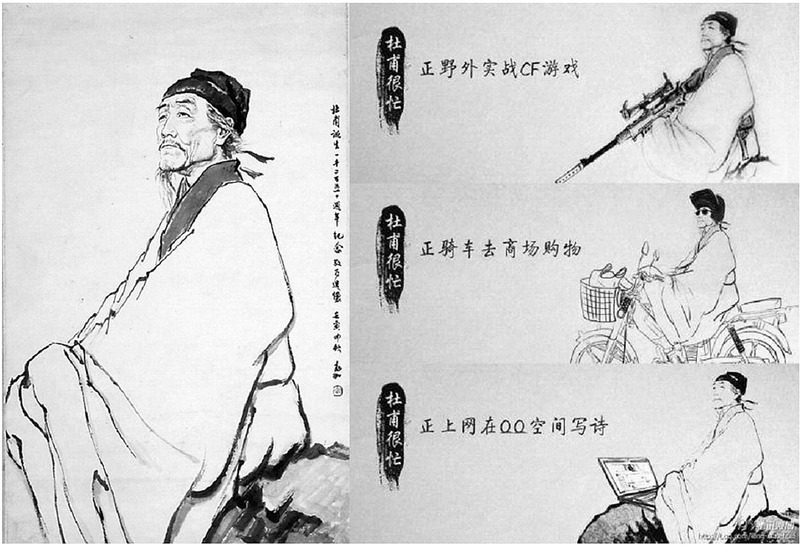 The Confucian ethos elevates faithful service, but who was to be served was shifting with the tide of rebellion. Reading Du Fu’s poems from the 8th Century as a small-part-citizen witnessing an empire disrupted in folly can have eerie resonances. If time is boustrophedon, wrapping back next to itself, then Du Fu may still be with us. I could not find a clean literal translation of the original ideograms for the entire poem, only for about half the lines. I was able to find three previous English translations, which I could at least triangulate for the parts I didn’t have the raw stuff for. Looking at what I had, I noticed that Du Fu was making constant juxtapositions, comparisons of contrast. Even the opening lines had water pushing and wind sighing and reflecting. That seems conventional, even a commonplace like “oh no, the wind and rain” in an English folk ballad, but it’s followed by a jump to rodents running through a roof, so close to a translation of the English idiom “bats in the belfry.” I decided to take Du Fu as intentional here. Events may seem to push you, or you may sigh and accept them, but “Rats are running in the rafters.” The ruin is real, and for that matter, your mind may reflect that too. What follows is part “Ozymandias” without Shelly’s political radicalism, and part ghost story. A ruined palace, once as lush as Mar-a-Lago, haunted by ghosts. I was puzzled by the “green ghost fires” referred to in this section, what with my limited knowledge of Chinese culture. Those three words are wonderous, but I still don’t know exactly what Du Fu is describing. Are there actual fires, lit as protection from ghosts (akin to the tradition of ghost lights in theaters)? Why green? Is it brightly colored moss or overgrowth in the ruins? Is Du Fu seeing luminous ghosts (instead of hearing them as he does later in the poem)? I can’t tell. Looking at some online material on Chinese ghosts, I see that this end of August/beginning of September period is sometimes celebrated as “ghost month” in China, and various things are done both to connect with or protect oneself from various spirits. Offerings, such as burning a pile of currency may be left out. I have no idea if that goes back to Du Fu’s time, but in our current world, the thought of a burning pile of greenbacks to keep one safe from long dead rich people sure seems like a vivid image. And water is running over the palace’s roadways. Just what is the sea level of Mar-a-Lago if global warming isn’t only a political question? As you listen to “Jade Flower Palace” perhaps you’ll want to pay notice to Du Fu’s subtle use of juxtapositions. More so than the other translations I read, I sought to bring those forward in mine. Translators seem to differ on Du Fu’s final lines, and that was a part where I didn’t have a literal translation to draw from. As midnight approached, I left two alternatives for my decision of what the final line should be to follow “There are many paths away from here.” It could be “How long are any of them?” or “None of them go on forever.” In the morning I decided that I would keep both, another juxtaposition. In the performance on Friday I used this as our band warm up, where we loosen up our old and demented fingers, a cold first take. I repeated the first two lines once more at the end both to emphasize that they should be heard as more than commonplaces, and as a reminder (to invert a proverb of mysterious origin) that history isn’t necessarily instructed by rhyme, but repeats. To hear the LYL Band perform Du Fu’s “Jade Flower Palace,” use the player below. This is interesting to me for several reasons. First my empathy and sympathy are aroused by that all too familiar sense of too many things asking if not demanding one’s attention. “Palace intrigue” made for a wry smile. The music good – to my untrained ear there was a touch of Steely Dan and Traffic and of course something from the days back when Ginsberg might set a poem to music. Nicely done. What really blew my mind was the details about Boustrophedon script and the idea that time runs back on itself but in a lovely bit of Synchronicity what really struck me was that the style of writing was in wide use in ancient Greece. I’m currently at work on a new, longish piece examining repetition and I’ve been looking at specific Greek myths and trying out different reasons for them to have been created – beyond the obvious idea that they serve a kind of admonishing purpose. In other words trying to enter the thought process behind the structure of the myth. It seems likely that the repetition in the myths may be down to a sense of time being Boustrophedonian. I’m paying attention to Sisyphus and I have some ideas about the thinking behind the myth but adding in the idea that it may have originally been written in a Boustrophedonian style is exciting. And, should have added: The poem by Du Fu is really very good! It would be interesting to see what effect some reading had on pols – we’ve had a few who were literate and the results were mixed but I’d rather they read than not.